I was working in the Nursery this morning and could hear what I thought was the neighbour’s air conditioner. It was there in the background but I could not track the other noise that was there. When I looked up above my head I saw it. 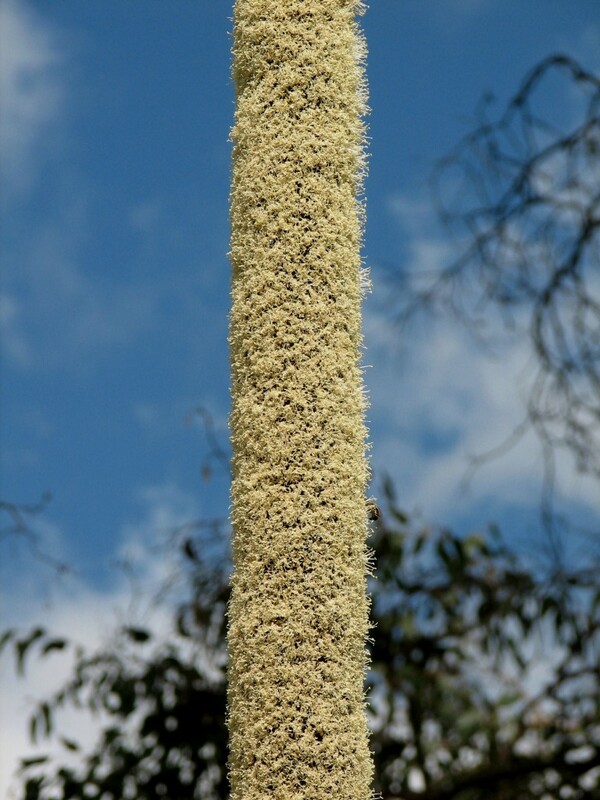 There were hundreds of bees in the canopy of the tree because it was smothered in flowers. 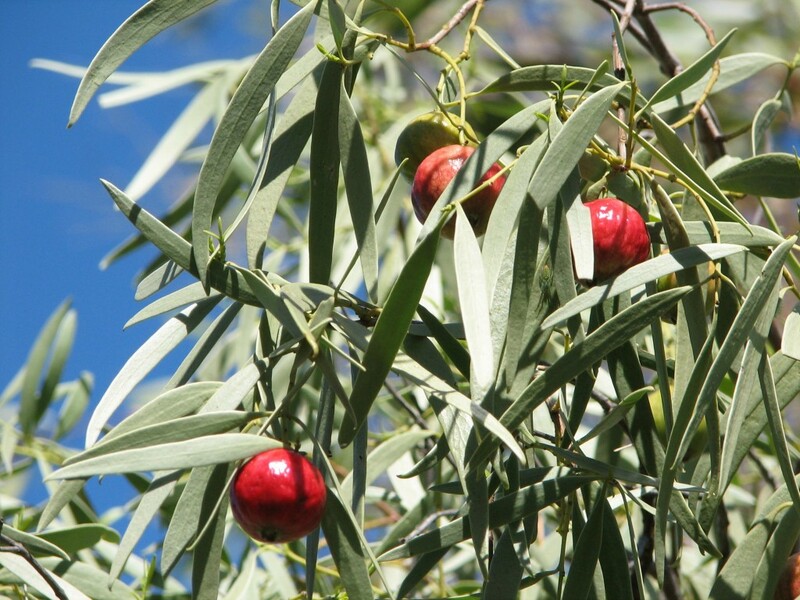 I love our local mallee trees. Against all odds they put on beautiful new new leaf growth and flower prolifically when everything else has ‘quietened down’ for the hot summers we have here. We seem to have three different species and they flower consecutively. If I was into bee keeping, it would be worth while having hives here for about three months. These are moderately fast growing plants suitable for limestone soils. 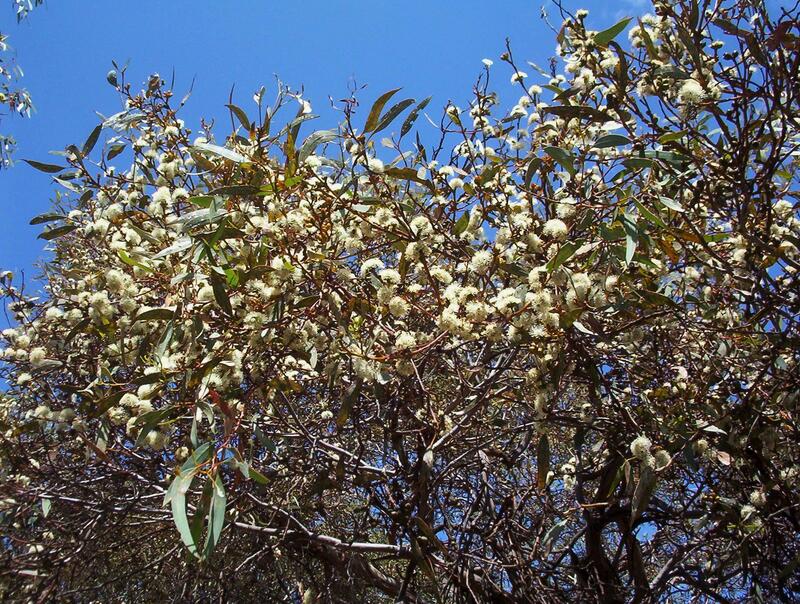 Most of the Eucalypts at Lowan Conservation Park are the mallee, Eucalyptus socialis. I found a good specimen to photograph. I wanted to gather an album of local Eucalypts. The mallees are great survivors. When top branches are chopped down, or blown down, or burnt by bush fires, they shoot again from buds in the stump, called a lignotuber. 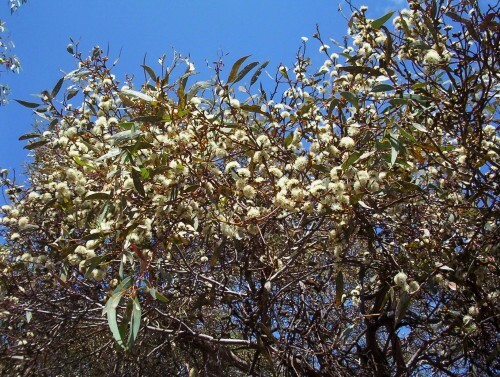 The trees can look dead and be covered in new shoots within weeks. What a find today! Husband found this on his morning walk today. I knew that they grew up the hill but I thought it was too early for ripe fruit. It is a wonder they are still there with the number of people who drive past. At a Christmas break up a couple of years ago, one of the Australian Plant Society members made a fabulous Wild Peach Pie, which we had with cream. What a treat. These seem to be shrubby plants here and I think are suckering plants. They are parasitic and grasses are used as the host in the home garden situation. I did hear that in orchard situations with the extra water and fertiliser, hosts are not needed. I need to research this as I want to have a smalll grove of these. See more information here. 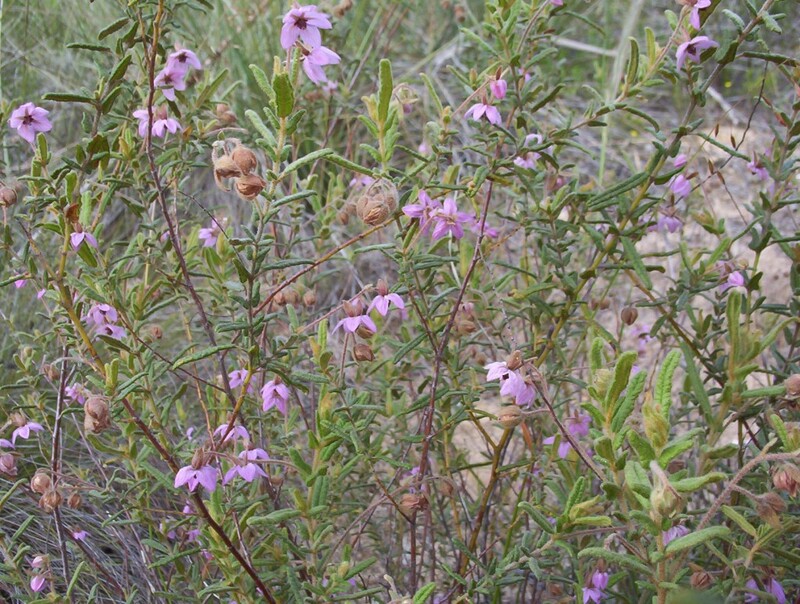 One of my ambitions has been to get a photographic record of the Australian native plants which occur in the South Australian Mallee. 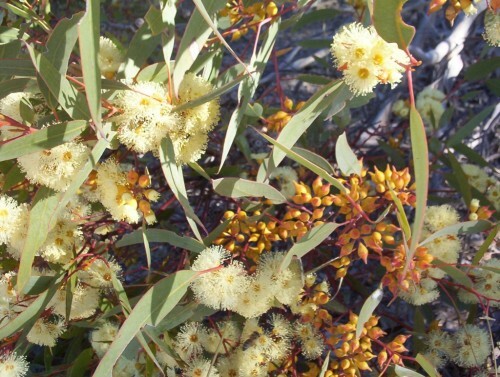 In particular I want a record of flowering plants in the local mallee. We went for a drive the other day and found a few I haven’t seen flower for years. This could be due to the fact that we haven’t been in the area at this time of the year for ages. Thomasia petalocalyx (Paper Flower) is one of the pretty local natives that grows well in the garden. 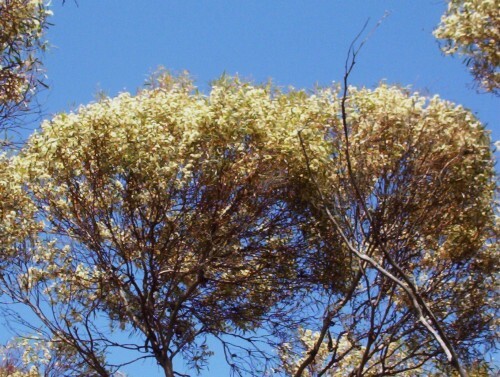 This photo was taken in mallee scrub south of here. The plant grows to about a metre tall and is wider. The nodding flowers are a pretty mauve and have a papery quality about them. The bush seems to have flowers on it most of the year. Once again this is a hardy, drought tolerant plant. The leaves are a little hairy which possibly means that it needs to be in an open position in areas where high humidity occurs. 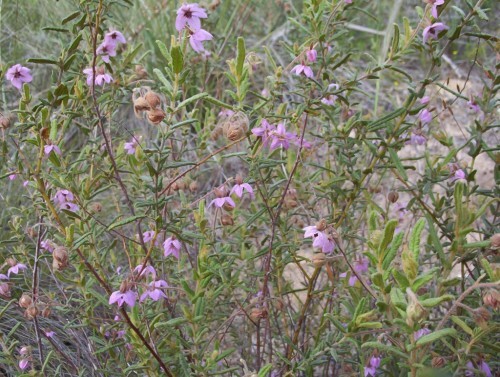 This plant also occurs in Western Australia and Victoria. You are currently browsing the archives for the Plants of South Australia category.